Moving is hard enough without having to worry about losing your children beneath piles of boxes. Whether you’re headed to the other side of the country or just down the block, moving with kids is always complicated. We understand how difficult it is to keep an eye on kids and manage a move at the same time. That’s why we’ve compiled these six tips especially for parents and guardians like you. Give these best practices a shot next time you’re moving with munchkins. We get a feeling the process will feel much easier. This is an especially helpful tip if your children are young. If you only want to pack a toy once (and you do), don’t make your move until after you’ve put your toddler to bed. If you start to pack sooner, you’re going to wind up repeating your process. Toddlers and young kids tend to take toys out of their boxes as soon as you turn your head. They can’t help it; you made that toy look so fun when you were putting it away! Wait to pack up the fun-looking stuff until your child isn’t around. That way, you know it’ll stay packed. Kids are less likely to irritate or become irritated during a move if you get them to participate. They’ll have something to keep them busy, and you might be surprised how much they can help! You could ask even young children to help with a surprising number of moving-related activities. They could put stuffed animals in a box, take clothes off hangers, or stack books into piles. Make sure you let them know how much you appreciate their help. Getting your kids to help is a great way to raise their morale, build their confidence, and complete your move! When kids go looking for something and can’t find it, disaster strikes. Obviously, These disasters become far more likely during a move. Prevent child meltdowns by using tape or labels to color-code your moving boxes. Associate each color with a category, and you’ll always know where to find whatever you’re looking for. For example, you could use pink tape for toys, blue for clothes, purple for stuffed animals, and so on. Kids are unpredictable. No matter how well you think you’ve accounted for them, they have a way of dismantling your plans. The only real way to account for the unaccountable is to take the possibility of time crunch out altogether. Figure out how long you think something will take, then add plenty of time. Think you can start packing two weeks before you move? Start a month early instead. Think you can finishing boxing up that room in a day? Give it three. By starting earlier than you think is "reasonable", you'll end up with one of two outcomes. Either you’ll finish early, or you’ll get done on time despite multiple child-sized hold-ups. Both are better options than running short on time and stressing yourself out. This may seem like an obvious tip, but it’s something so innocuous that many movers forget about it. If you have multiple kids, avoid a potential blow-out fight by figuring out who gets which room BEFORE you’re there. Allow them to spend time getting excited about their new room, instead of fighting over which is theirs. Kids don't like change, especially when it's sudden. Take the edge off by taking them to visit the new place before the move itself. If it's a reasonably close move, you can take them to tour the neighborhood. If you're moving too far to visit, you can do video tours or check out the area with them online. 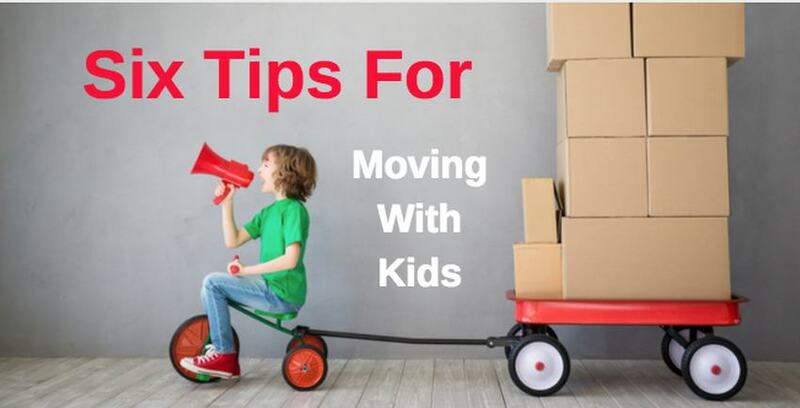 Easing your kids into a transition tends to smooth out the moving process. Moving with children is like moving without them… just a little bit harder. We know how it can be, and we know how many things can pile up around your home when you’re a parent. Here’s our last tip: don’t forget that a storage unit can help you to better organize your home and possessions during a hectic move.